How many times have you found a blog post promising to help you make money online, and then being disappointed finding out there were no practical suggestions, but only fluff? I guess most of the times. In this post you are going to read the answers of 4 bloggers about two important questions on how to earn an income with the internet, with the mention of resources and practical tips. Q. What Are Your Top 3 Ways to Make Money Online? For me it was developing personal skill that I could then sell as a service. This has been by far the most lucrative and effective way of earning money online for me. Using websites such as Freelancer, Fiverr and oDesk I have been able to make $1000+ per month. This is consistent income and I’m also learning on the job so it’s the best of both worlds. Developing these personal skills also greatly improves what I can now do when running my own blog. I have the skills to customize a theme, design graphics for my blog posts, create professional, edited videos for my youtube channel. The list goes on, and I would have to pay someone else to do all this for me, and it would likely cost me $1000+ per month to do it to the quality I create myself. My three favorite ways to make money online are as follows. First, I am a freelance writer. Most of my business comes from blogging, email marketing, copywriting, social media posts, and ebooks content for clients. I generally get business from writing for top blogs, referrals, and even get some business from the job boards. Second, I am the author of the new book, Start Up Gap. It is my 2nd book on Amazon, and 4th book on Kindle. The book makes some money, and promotes my freelance writing abilities. Third, I also do some business and marketing coaching. As a former teacher, I know best practices for guiding entrepreneurs. I have a few coaching clients that I work with to develop their own business. I make money online by providing writing services. I wish I could find more sources of income but I am still getting there! I am a paid contributor and a ghost-writer working in multiple industries. Selling copy writing services hasn’t bee hard. Lots of people are looking for original content! I started at Digital Point several years ago, simply replying to “Looking for copywriter” help. After 7-8 months of doing that diligently and providing good content, I accumulated a few recurring clients and a few agencies that outsourced content writing to me. Since then I haven’t had to even look for order as I still rely on those relationships. I can’t take more as I am writing everything myself and I don’t want to hire anyone to help as this will make things more complicated! 1: Selling products or Service: If you are an expert enogh in your field, there is always an opprotunity to sell your expertise knowledge into an ebook, consulting or coaching, DVD, software etc. Once you do that, with perfect marketing and promotions you would be able to earn much more than any other method online. 2: Affiliate marketing: Affiliate marketing is one of the way that many bloggers are already succesful with and making quite a handsome money online. The secret to be succesful in it is hiddin in the content, prduct and your audeince. 3:Product review: This is method that I personally use on my blog to generate income.To get good sponsers and product you should not wait them to get to you, instead go and give them the offer to get feature on your blog. Fiverr – Great for small, quick jobs, the marketplace is a little crowded now so it’s hard to get your foot in the door compared to when I started but if you can offer something of quality you should make sales. Freelancer – My biggest earner for me, this month alone I’ve landed a $500 job as well as a few $200 jobs. If you can create a decent profile and communicate effectively you should be able to make a decent income. You need to have a skill to sell though! Other that I don’t use anymore myself but helped me make my first few dollars. Surveybods – One of the few survey sites that are legitimate and actually pay. Digital Point Forums – Head over the the job offers section and try to pick up some low-skilled jobs. Here are my favorite 5 sites to help you earn money on the internet. This is in no particular order. These are all sites that earn me money through the three ways that I earn money through internet marketing. I am sharing 15 sites I am using to contribute paid articles from time to time here. the only thing that stands between you and online income is YOU. In online world the best part which I love is that you don’t need to spend your money in order to learn something because there are number of people around to help you out for free. Here are 5 sites that help me and teach me to earn online. Thanks to the bloggers who shared their knowledge in this post and thank you for taking the time to read. I hope you found something interesting to help you make money online. I would like to hear your experience too. Can you answer to the first or the second question mentioned in this post, leaving a comment below? I am excited to learn from you too! I have been trying to make some money through the internet for yrs now. Besides a little success here and there, there\’s nothing mch I\’ve been able to earn. Could you suggest something? You can start browsing the resources mentioned in this post, Lemiya. The above mentioned resources are best to earn enough to make even living from blogging. Although if you want to earn that much money affiliate marketing is the best option as I have discussed above. Apart form that I would suggest to also try your luck in product reviews which I have been doing on my blog. One more way which I want to add here is the method to earn from niche blogging which is also a good way to generate quick income. Thanks for your suggestions and contribution! Clixsense is the easiest way to make money online. There are plenty of survey based internet sites out there. Clixsense gives you offers from most of them, collecting them in one place. Smooth right? I’ve been a member here for a while now and there’s no other place that offers surveys, tasks, paid to click links and much more in just one website. In my opinion content marketing is the easiest method to make money online. This method involves uploading videos to YouTube on a daily basis. Overtime your traffic will increase and after a year you will make a living online. Your introduction is very interesting. Indeed, that’s the reality of articles that offer how to make money online. Not all the articles provide what readers want. For me, some time ago I did a lot of things, begin from advertising, affiliate, digital point forum, even adsense. Although it works to make some money, but it is fleas, there is not one single thing that I focus on, it’s too bad. This article helpful for me. Thanks for sharing! you will find out what really works best for you. Thanks Nanda for your words, product review is my main source of income and I think it is easiest from all the methods of making money. Sponsored posts are a great way to monetize a blog. But you need to build some authority and trust before. Addon to above and more easier way are Adsense, Media.net & Youtube on priority, Their are more on this list but they dont give worth the traffic. Thanks for the adds, Deven. Visiting your blog after about 2o days which is very long time. I am quiet happy to see the first article on your blog right now. I love to learn from the pro blogger via their interviews as you did. I am pretty curious about earning from paypal as Andy Nathan mentioned. Can you please make me clear about this case? Happy to see you in this blog too. you can use their affiliate program to make money referring people for the business profiles. Thanks for the online money making tutorials. Yeah, majority of blogs and websites share their ways of making money online, but I bet you that it’s only 5% or less that are actually making money. Some even share tips that doesn’t exist 🙁 . But in all, thanks for the wonderful article and do have a great day. many times the difference from making money or not is having the right resources to use. Those are some popular ones, Srimanthudu. Your introduction makes a whole lot of sense; most people who writes about making money online never in reality have make any significant money themselves. You can easily write and convinced your readers to belive you on any other topic, but not in making money online. People need practical example to believe your advice are good enough to act upon. As for me, affiliate marketing as been the best way to make a few $ online and I’ll like to say this for beginners bloggers hoping to make something for themselves; “choose one system and work your boots off it till you are satisfied with yourselves”. Stop jumping from one money making program to another, you’ll never make money like that. You need some targeted traffic to make money as affiliate marketing, Shamsudden. Also, being a authoritative blogger helps a lot, as people trust you and will be more likely to purchase from your links. Wonderful tips by 4 bloggers at one place. Amazing and very helpful too. I never heard about these people except “Pramod Sharma”. Thanks for introducing here. I will surely try these techniques to monetize my blog ans earn some money online. Thanks again for sharing. Have a wonderful week ahead! Glad you enjoyed the post, Nisha. and have an awesome week! Thanks Nisha, your words mean a lot as is coming from you. I have also been through your blog, and your posts are always interesting. These money making techniques are the only techniques that has been making some bloggers turn their blog into a successful buisness. It’s great to see how this kind of posts give the chance both to readers and the bloggers mentioned, to connect with each other! Awesome post. I think this is a bit different from all other posts with same topic. It surely become a superb post if it is an interview-type. You managed to reach probloggers. So very much interesting. It is very helpful for anyone who tries to step their foot into writing. Thank you very much for sharing yet another stunning post. This post is really very interesting in which i learn a lot about Making money online and see lots of website to help in this process. But I am already earn online though Adsense. but I think there are lots of method that you already mentioned here to make more than Adsense. Thanks Erik Emanuelli for sharing such fantastic topic. Adsense is pretty the most popular and easiest way to monetize a site, Areesha. I guess that is the way to start. But there are so many other ways to earn an income online. Keep doing a great work and they will come! I love that several people mentioned writing as a way to make money. I think as bloggers, we all have to love writing since it’s the heart of what we do. Getting paid to write is probably the best thing in the world to me as far as making money is concerned. If I’m going to write anyways, I might as well get paid for it! An experienced blogger should be (most of the times) also a good writer. I learn from the pro blogger via their. I am pretty curious about earning from paypal as Andy Nathan mentioned. you can make money with PayPal affiliate program by referring people to sign up with a business account. I will try make money with PayPal affiliate program by referring people. Thanks Erik Emanuelli! You must find what is really works for you, Shawn. My main income sources are from selling ads, sponsored posts and freelance services. Unless you have millions of impressions, those monetization methods would give you just pennies, Jesse. Getting paid to write is probably the best thing in the world to me as far as making money is concerned. If I’m going to write anyways, I might as well get paid for it! That’s an awesome way to make money online, with freelance services. Really interesting to see what people are saying here. I think there are many ways to make money online but it all depends on the person and their expertise…Personally I find coaching is a great way to make money online! These ideas are really useful and most are tring to implement on their business for being a great online marketer as well as earning .. Regardless of how you choose to make money, whether it’s affiliate marketing, your own product/services, etc. I think what must come before everything is an in depth understanding of your audience. If you don’t fully understand them it really doesn’t matter what kind of content you’re producing because you’ll most likely miss giving them what they want. You should have a full understanding of their age, job status, dependent status, and anything (and everything) you can find out about them. You can learn some of these things by hanging out in forums and Facebook groups that your target audience hangs out in. 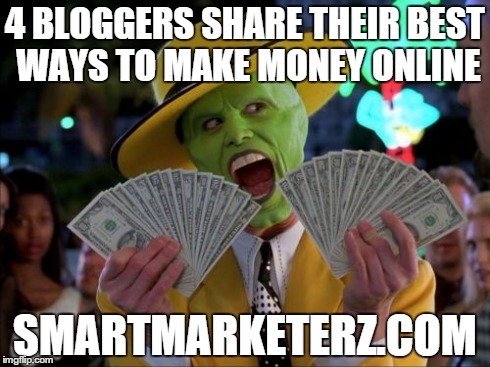 Hi Erik, I really liked your article about ways to make money online. Keep sharing such articles. Thanks for sharing. .
Hi Erik, Thanks for all the valuable info and also the extra motivation. Blogging can get frustrating sometimes and it is nice to here that others also struggle with the same things I do. Building a business requires dedication and alot of times a monetary investment but not always if one is patient. Alot of people can not afford to outsource and must do all the marketing on their own which takes alot of dedication and work. Thanks for this very inspirational post. Thank you for sharing all of this information with all of us out here on the Internet. I love it when I see other people’s post of how they Provide other people with Information to make money online and all that is left to do is take action….. I would like to leave you with this TIP: I love having an online business and I have been in the Online Busniess Niche for a while now. I am also part of a very powerful online business.I found that the best ways for you to really make GOOD money online and Passive constant income is by Making youtube Videos and linking Adsense with that and the Other way is with a BLOG which is also my Primary Business! Thanks for these ultimate ways to have money online. Really a good list. I created a video where I share multiple FREE WAYS to make money online and know that all the readers will appreciate this. Please watch my video, leave a comment and I would appreciate if you could maybe use my video in a future post. Many can earn from affiliate marketing. For that need product, audience and content. You may get quality product but content and audience is tough. However many can do this easily. Hop we all do that easily. Yes, the above-mentioned methods are best for earn money through the internet but I think the good amount of money u can make through money making sites without investment i really appreciate the flare of writing . Nice blog!! I like this blog beacuse i read this page and get more information related to make money online..
Hi Erik Emanuelli, you have put some good effort by sharing some excellent information in this high value article. Awesome..!!! You can get knowledge about how can “Make Money Online” at your living room. I would like to go with affiliate marketing. And later other. I guess i will succeed. Nice Blog, Good information is shared. We can also earn money by uploading, there are many websites that pay money for uploading valuable content. Check on website MakeMixMoneyOnline for more information. I wish I would be successful one day. I would like best Affiliate marketing on my way. Thanks for publishing this useful article. Thank You for your work and sharing of all the great information on your blog.These tips has been implemented by many bloggers in the successfully helped in their blogging activities. In my experience online teaching is the most effective and rewarding way to make money online. If you have adequate teaching skills you can easily use online software to take online classes. There are some companies that hire teachers online. That is awesome blogger that can make 6 figures income from home, so can you talk to me how many figures you can earn now? That’s a good looking website…Looks AWESOME! I was going through things randomly,and found your blog!! The ideas are Amazing. Likewise I came across with a Very unique and genuine Concept to earn unlimited Free Paytm cash / payPal cash by Doing Almost Nothing. I personally found this Intresting !! And yes, All you have to do is just click on the survey forms and you can earn Unlimited Free Paytm Cash. And the best part is you need not sit and write answers!! All you have to do is to select the options by clicking the options there!! It is that EASY!! You earn points and you can redeem it right away!! Also there will be monthly awards! Sweepstakes to be precise. Where in we can spend 500 points to buy a ticket and try our Luck!! They prizes are worth 20k and 10k Flipkart and Amazon Vouchers!! Which is Insanely Awesome! Every survey we can earn close to 1000Points which hardly takes 3-4minutes . I found this trick awesome and I felt like sharing it. Go to the website and register. More Genuine you are More can you Earn!! I’m amazed that you write like this article in 2014. Informative article. is there any other new article about make money online ? Have you tried sponsored posts?